Die Martis, 27° Martii 1832. M'Crae to enter into a Recogce on Scott's Appeal. Murray's et al. Petition referred to Judges. Messages to H.C. that the Lords have agreed to the 2 preceding Bills. Messages to H.C. with Amendments to the 2 preceding Bills. Resolutions of East India Co. granting Salaries, &c. delivered. A. & J. Dixon v. Dixon et al. The King's Answer to Address. Parliamentary Representation, Papers respecting, delivered. Burial Grounds, Petition from Stoke Damerel respecting. Tithes & Church Cess, (Ireland,) Petition from Drumconrath, &c. for Abolition of. Tithes, (Ireland,) Petitions from Rower & Kilsaran, &c. for Abolition of. 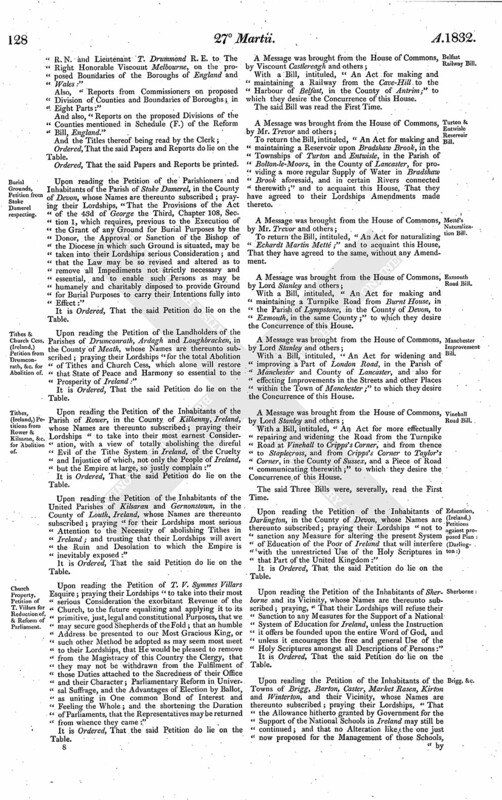 Church Property, Petition of T. Villars for Reduction of, & Reform of Parliament. Turton & Entwisle Reservoir Bill. Elections of Peers for Scotland, Minutes of Proceedings at, Ordered. Reform (England) Bill, Petition from Aberdeenshire in favor of. Common Law Courts Process Bill. Commons Answer to Message of Yesterday. Mills & Factories, Petition from Canterbury for regulating Hours of Labour in. Zemindar of Nozeed Bill, Evidence, &c. of H.C. communicated, & referred to the Com ee on the Bill. Slane Peerage, Com ee to meet. Ds. Brougham & Vaux, Cancellarius. Ds. Dinorben. March. Lansdowne, Præses. The Earl of Shaftesbury sat Speaker by virtue of a former Commission. The House being moved, "That Andrew Murison M'Crae of Queen Square, Westminster, Gentleman, may be permitted to enter into a Recognizance for Alexander Scott Esquire, on account of his Appeal depending in this House, he residing in Scotland:"
The same was agreed to; and Ordered accordingly. It is Ordered, That the Consideration of the said Petition be, and is hereby referred to Mr. Justice Park and Mr. Justice Patteson, who are forthwith to summon all Parties concerned in the Bill, and, after hearing them, are to report to the House the State of the Case, with their Opinion thereupon, under their Hands, and whether all Parties, who may be concerned in the Consequences of the Bill, have signed the Petition; and also, that the Judges, having perused the Bill, do sign the same. Hodie 3a vice lecta est Billa, intituled, "An Act for more effectually repairing and improving the Road leading from the Alfreton Turnpike Road near Mansfield, through Tibshelf and Morton, to the Nottingham Turnpike Road near Tansley, and other Roads connected therewith, in the Counties of Nottingham and Derby." Hodie 3a vice lecta est Billa, intituled, "An Act for inclosing Lands in the Parish of Caversham, in the County of Oxford." To acquaint them, That the Lords have agreed to the said Bills, without any Amendment. Hodie 3a vice lecta est Billa, intituled, "An Act to equalize the Ecclesiastical Burthens of the Parish of Saint Mary, Islington, in the County of Middlesex; for partially altering the Application of the Rents and Profits of the Stone Fields Estate within the said Parish; for letting the Pews in the Parish Church of Saint Mary, Islington, and the Chapel of Ease thereto; and for other Purposes connected therewith." The Question was put, "Whether this Bill, with the Amendments, shall pass?" Hodie 3a vice lecta est Billa, intituled, "An Act to amend several Acts relating to London Bridge and the Approaches thereto." "37. Gracechurch Street Corporation of London William Naish William Naish Henry Blenkinsop"
To return the said Bills, and acquaint them, That the Lords have agreed to the same, with several Amendments, to which their Lordships desire their Concurrence. Hodie 1a vice lecta est Billa, intituled, "An Act for exchanging certain detached Parts of the Entailed Estate of Craigends, in the County of Renfrew, belonging to William Cuninghame Esquire, for certain other Lands held by him in Fee-Simple." The House being informed, "That Mr. Danvers, from the Court of Directors of The East India Company, attended;"
"Resolutions of the Court of Directors of The East India Company, being the Warrants or Instruments granting any Salary or Gratuity:"
And also, "Resolutions of the Court of Directors of The East India Company, being the Warrants or Instruments granting any Pension." The House being moved, "That a Day may be appointed for hearing the Cause wherein Anthony Dixon Esquire and John Dixon Esquire are Appellants, and William Dixon, and others, are Respondents, exparte, the Respondents not having put in their Answer to the said Appeal, though peremptorily Ordered so to do:"
It is Ordered, That this House will hear the said Cause ex-parte, by Counsel at the Bar, on the first vacant Day for Causes after those already appointed, unless the Respondents put in their Answer thereto in the mean time. The Earl of Shaftesbury (in the Absence of the Lords with White Staves) reported, "That they had (according to Order) waited on His Majesty with their Lordships Address of Yesterday; and that His Majesty was pleased to receive the same very graciously, and to say, He would give Directions accordingly." The Earl of Shaftesbury reported from the Lords Committees, to whom the Bill, intituled, "An Act to alter, amend, enlarge and extend the Powers of several Acts passed in the Ninth and Tenth Years of the Reign of His late Majesty King George the Fourth, for making and maintaining the Clarence Railway," was committed; That they had considered the said Bill, and examined the Allegations thereof, which were found to be true; and that the Committee had gone through the Bill, and directed him to report the same to the House, without any Amendment." The Earl of Shaftesbury reported from the Lords Committees, to whom the Bill, intituled, "An Act for continuing, establishing and confirming unto and upon John Ingram Lockhart Esquire the Surname and Arms of Wastie, pursuant to the Will of Francis Wastie Esquire, deceased," was committed; "That they had considered the said Bill, and examined the Allegations thereof, which were found to be true; and that the Committee had gone through the Bill, and made some Amendments thereto." Which Amendments, being read Twice by the Clerk, were agreed to by the House. Ordered, That the said Bill, with the Amendments, be ingrossed. "Abstract of the Population, Assessed Taxes, &c. of the Boroughs contained in the Boundary Reports, so far as the same can be ascertained:"
Also, "Report from Edward J. Littleton Esquire, M. P. Captain F. Beaufort R. N. and Lieutenant T. Drummond R. E. to The Right Honorable Viscount Melbourne, on the proposed Boundaries of the Boroughs of England and Wales:"
Also, "Instructions, &c. referred to in the Report from Edward J. Littleton Esquire, M. P. Captain F. Beaufort R. N. and Lieutenant T. Drummond R. E. to The Right Honorable Viscount Melbourne, on the proposed Boundaries of the Boroughs of England and Wales:"
Also, "Reports from Commissioners on proposed Division of Counties and Boundaries of Boroughs; in Eight Parts:"
And also, "Reports on the proposed Divisions of the Counties mentioned in Schedule (F.) of the Reform Bill, England." Ordered, That the said Papers and Reports do lie on the Table. Ordered, That the said Papers and Reports be printed. Upon reading the Petition of the Parishioners and Inhabitants of the Parish of Stoke Damerel, in the County of Devon, whose Names are thereunto subscribed; praying their Lordships, "That the Provisions of the Act of the 43d of George the Third, Chapter 108, Section 1, which requires, previous to the Execution of the Grant of any Ground for Burial Purposes by the Donor, the Approval or Sanction of the Bishop of the Diocese in which such Ground is situated, may be taken into their Lordships serious Consideration; and that the Law may be so revised and altered as to remove all Impediments not strictly necessary and essential, and to enable such Persons as may be humanely and charitably disposed to provide Ground for Burial Purposes to carry their Intentions fully into Effect:"
Upon reading the Petition of the Landholders of the Parishes of Drumconrath, Ardagh and Loughbracken, in the County of Meath, whose Names are thereunto subscribed; praying their Lordships "for the total Abolition of Tithes and Church Cess, which alone will restore that State of Peace and Harmony so essential to the Prosperity of Ireland:"
Upon reading the Petition of the Inhabitants of the Parish of Rower, in the County of Kilkenny, Ireland, whose Names are thereunto subscribed; praying their Lordships "to take into their most earnest Consideration, with a view of totally abolishing the direful Evil of the Tithe System in Ireland, of the Cruelty and Injustice of which, not only the People of Ireland, but the Empire at large, so justly complain:"
Upon reading the Petition of the Inhabitants of the United Parishes of Kilsaran and Gernonstown, in the County of Louth, Ireland, whose Names are thereunto subscribed; praying "for their Lordships most serious Attention to the Necessity of abolishing Tithes in Ireland; and trusting that their Lordships will avert the Ruin and Desolation to which the Empire is inevitably exposed:"
Upon reading the Petition of T. V. Symmes Villars Esquire; praying their Lordships "to take into their most serious Consideration the exorbitant Revenue of the Church, to the future equalizing and applying it to its primitive, just, legal and constitutional Purposes, that we may secure good Shepherds of the Fold; that an humble Address be presented to our Most Gracious King, or such other Method be adopted as may seem most meet to their Lordships, that He would be pleased to remove from the Magistracy of this Country the Clergy, that they may not be withdrawn from the Fulfilment of those Duties attached to the Sacredness of their Office and their Character; Parliamentary Reform in Universal Suffrage, and the Advantages of Election by Ballot, as uniting in One common Bond of Interest and Feeling the Whole; and the shortening the Duration of Parliaments, that the Representatives may be returned from whence they came:"
With a Bill, intituled, "An Act for making and maintaining a Railway from the Cave-Hill to the Harbour of Belfast, in the County of Antrim;" to which they desire the Concurrence of this House. To return the Bill, intituled, "An Act for making and maintaining a Reservoir upon Bradshaw Brook, in the Townships of Turton and Entwisle, in the Parish of Bolton-le-Moors, in the County of Lancaster, for providing a more regular Supply of Water in Bradshaw Brook aforesaid, and in certain Rivers connected therewith;" and to acquaint this House, That they have agreed to their Lordships Amendments made thereto. To return the Bill, intituled, "An Act for naturalizing Echardt Martin Metté;" and to acquaint this House, That they have agreed to the same, without any Amendment. With a Bill, intituled, "An Act for making and maintaining a Turnpike Road from Burnt House, in the Parish of Lympstone, in the County of Devon, to Exmouth, in the same County;" to which they desire the Concurrence of this House. With a Bill, intituled, "An Act for widening and improving a Part of London Road, in the Parish of Manchester and County of Lancaster, and also for effecting Improvements in the Streets and other Places within the Town of Manchester;" to which they desire the Concurrence of this House. With a Bill, intituled, "An Act for more effectually repairing and widening the Road from the Turnpike Road at Vinehall to Cripps's Corner, and from thence to Staplecross, and from Cripps's Corner to Taylor's Corner, in the County of Sussex, and a Piece of Road communicating therewith;" to which they desire the Concurrence of this House. The said Three Bills were, severally, read the First Time. 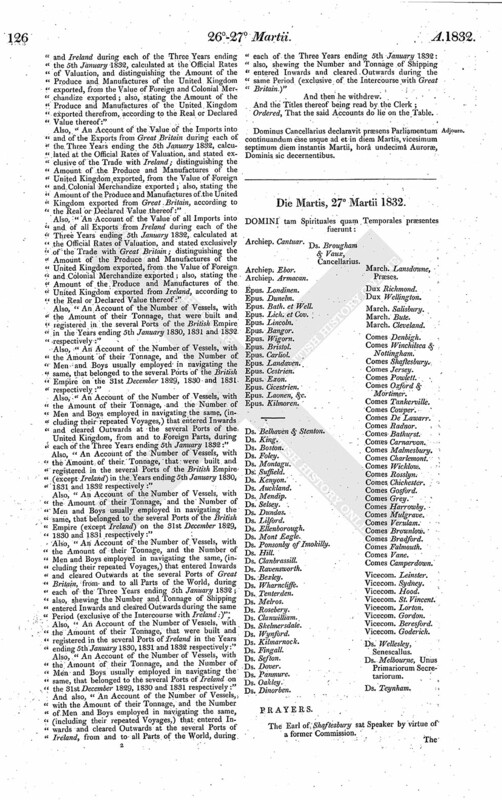 Upon reading the Petition of the Inhabitants of Darlington, in the County of Devon, whose Names are thereunto subscribed; praying their Lordships "not to sanction any Measure for altering the present System of Education of the Poor of Ireland that will interfere with the unrestricted Use of the Holy Scriptures in that Part of the United Kingdom:"
Upon reading the Petition of the Inhabitants of Sherborne and its Vicinity, whose Names are thereunto subscribed; praying, "That their Lordships will refuse their Sanction to any Measures for the Support of a National System of Education for Ireland, unless the Instruction it offers be founded upon the entire Word of God, and unless it encourages the free and general Use of the Holy Scriptures amongst all Descriptions of Persons:"
Upon reading the Petition of the Inhabitants of the Towns of Brigg, Barton, Caster, Market Rasen, Kirton and Winterton, and their Vicinity, whose Names are thereunto subscribed; praying their Lordships, "That the Allowance hitherto granted by Government for the Support of the National Schools in Ireland may still be continued; and that no Alteration like the one just now proposed for the Management of those Schools, by which the free Use of the Holy Bible is forbidden, as it were, to Children, be admitted to overthrow a System which seems to bid so fair for diffusing a more general Knowledge of Christ and His Religion than has yet been found to prevail in that most unhappy Portion of our Gracious King's Dominions:"
Ordered, That there be laid before this House authentic Copies of the Minutes of the Proceedings at all Elections of Representative Peers for Scotland, from the Year 1801 to the Year 1822, both inclusive. 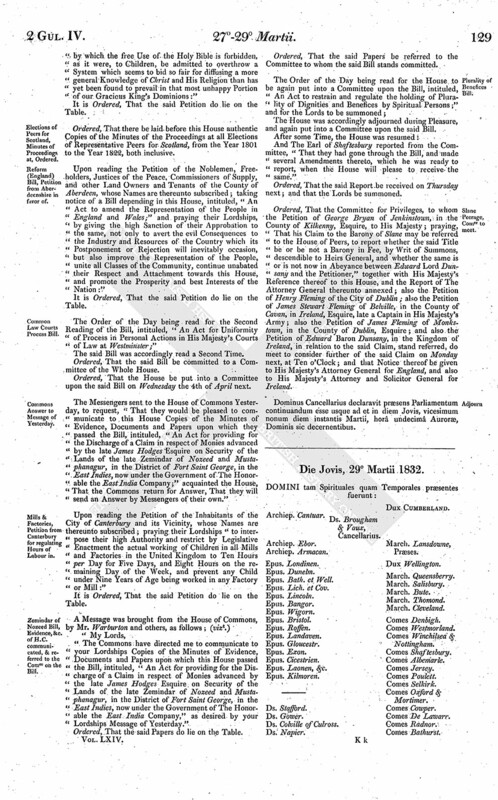 Upon reading the Petition of the Noblemen, Freeholders, Justices of the Peace, Commissioners of Supply, and other Land Owners and Tenants of the County of Aberdeen, whose Names are thereunto subscribed; taking notice of a Bill depending in this House, intituled, "An Act to amend the Representation of the People in England and Wales;" and praying their Lordships, by giving the high Sanction of their Approbation to the same, not only to avert the evil Consequences to the Industry and Resources of the Country which its Postponement or Rejection will inevitably occasion, but also improve the Representation of the People, unite all Classes of the Community, continue unabated their Respect and Attachment towards this House, and promote the Prosperity and best Interests of the Nation:"
The Order of the Day being read for the Second Reading of the Bill, intituled, "An Act for Uniformity of Process in Personal Actions in His Majesty's Courts of Law at Westminster;"
The said Bill was accordingly read a Second Time. Ordered, That the House be put into a Committee upon the said Bill on Wednesday the 4th of April next. The Messengers sent to the House of Commons Yesterday, to request, "That they would be pleased to communicate to this House Copies of the Minutes of Evidence, Documents and Papers upon which they passed the Bill, intituled, "An Act for providing for the Discharge of a Claim in respect of Monies advanced by the late James Hodges Esquire on Security of the Lands of the late Zemindar of Nozeed and Mustaphanagur, in the District of Fort Saint George, in the East Indies, now under the Government of The Honorable the East India Company;" acquainted the House, That the Commons return for Answer, That they will send an Answer by Messengers of their own." 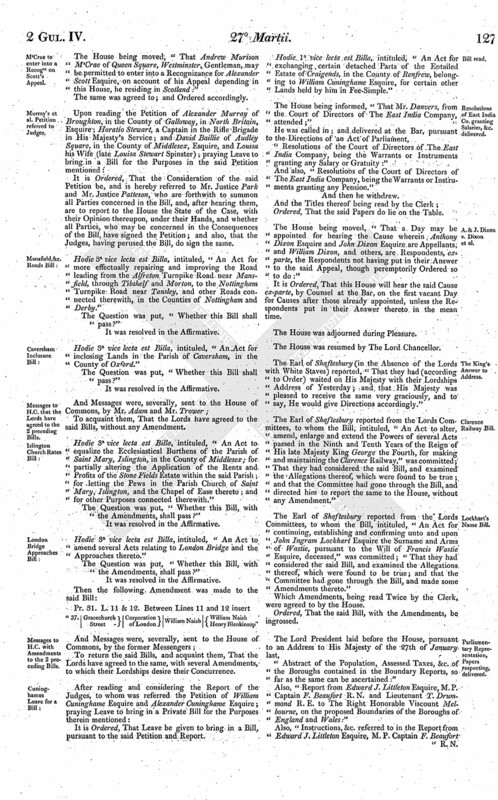 Upon reading the Petition of the Inhabitants of the City of Canterbury and its Vicinity, whose Names are thereunto subscribed; praying their Lordships "to interpose their high Authority and restrict by Legislative Enactment the actual working of Children in all Mills and Factories in the United Kingdom to Ten Hours per Day for Five Days, and Eight Hours on the remaining Day of the Week, and prevent any Child under Nine Years of Age being worked in any Factory or Mill:"
"The Commons have directed me to communicate to your Lordships Copies of the Minutes of Evidence, Documents and Papers upon which this House passed the Bill, intituled, "An Act for providing for the Discharge of a Claim in respect of Monies advanced by the late James Hodges Esquire on Security of the Lands of the late Zemindar of Nozeed and Mustaphanagur, in the District of Fort Saint George, in the East Indies, now under the Government of The Honorable the East India Company," as desired by your Lordships Message of Yesterday." Ordered, That the said Papers be referred to the Committee to whom the said Bill stands committed. The House was accordingly adjourned during Pleasure, and again put into a Committee upon the said Bill. And The Earl of Shaftesbury reported from the Committee, "That they had gone through the Bill, and made several Amendments thereto, which he was ready to report, when the House will please to receive the same." Ordered, That the said Report be received on Thursday next; and that the Lords be summoned. Ordered, That the Committee for Privileges, to whom the Petition of George Bryan of Jenkinstown, in the County of Kilkenny, Esquire, to His Majesty; praying, "That his Claim to the Barony of Slane may be referred to the House of Peers, to report whether the said Title be or be not a Barony in Fee, by Writ of Summons, descendible to Heirs General, and whether the same is or is not now in Abeyance between Edward Lord Dunsany and the Petitioner," together with His Majesty's Reference thereof to this House, and the Report of The Attorney General thereunto annexed; also the Petition of Henry Fleming of the City of Dublin; also the Petition of James Stewart Fleming of Belville, in the County of Cavan, in Ireland, Esquire, late a Captain in His Majesty's Army; also the Petition of James Fleming of Monkstown, in the County of Dublin, Esquire; and also the Petition of Edward Baron Dunsany, in the Kingdom of Ireland, in relation to the said Claim, stand referred, do meet to consider further of the said Claim on Monday next, at Ten o'Clock; and that Notice thereof be given to His Majesty's Attorney General for England, and also to His Majesty's Attorney and Solicitor General for Ireland. Dominus Cancellarius declaravit præsens Parliamentum continuandum esse usque ad et in diem Jovis, vicesimum nonum diem instantis Martii, horâ undecimâ Auroræ, Dominis sic decernentibus.